This page was thoroughly revised, 11 February 2019. The three proper prayers of one mass formulary reveal the dynamic movement of the eucharistic liturgy from entrance procession to the procession with the gifts and the communion procession and sometimes even hinting at the procession back home. The three prayers of each formulary present the divine-human exchange through a series of alternating divine and human actions both explicit and implied, active and passive. Each mass formulary expresses these dynamics in different ways. Heuristics: the student-researcher studies the literary composition and ritual contexts of the prayers. Hermeneutics: the student-scholar interprets the prayers in their liturgical-ritual context and according to a semiotic analysis of who does what to whom. Synthetics: the student-author writes a final paper in which the author presents the divine-human exchange in the chosen mass formulary to a class of seminarians at a major seminary. Heuristics: the student will have gathered essential information on the three prayers of one mass formulary, their Latin expression and liturgical context, and will have communicated this to colleagues in the seminar. Hermeneutics: the student will have interpreted the prayers both in their ritual-liturgical context and semiotic analysis of who does what to who in order to understand the dynamic movement of the particular eucharistic liturgy from the entrance to the presentation and communion and finally departure. The student will have communicated this to colleagues in the seminar. Synthetics: the student will have integrated the findings and interpretation into a classroom lecture for seminarians in a major seminary, and will have communicated this in oral form to colleagues in the seminar and in written form in a final paper. The student conducts personal research while engaged in collaborative conversation with colleague-scholars, as the professor carefully directs their attention and encourages deeper investigation. In this seminar the professor reviews the methods used in finding data, interpreting the three prayers in their respective contexts and writing a final paper; the professor provides careful moderation. In a first presentation each student presents to colleagues an analysis of the Latin expression of his or her three prayers. This is further developed in a second presentation, on the semiotics of the prayer, answering the question “Who does what to whom?”. In a final presentation each student presents a draft of his or her final paper to colleagues in the seminar. Each student integrates the data and findings in the preparation of a lecture on the divine-human exchange in the three prayers of the chosen mass formulary to address the concerns of a class of seminarians at a major seminary. Participants are encouraged to present their presentation materials to the instructor several days before giving each presentation so that the instructor may review the presentation and make suggestions for the student’s consideration. The final paper may also be submitted to the instructor in draft form for comments before its final submission. In the first round of presentations the student-researchers discuss the clear and accurate understanding of the Latin texts of the three prayers of each person’s formulary. In the second round of presentations the student-scholars discuss the semiotic analysis of who does what to whom in each person’s prayers and over-all formulary. In the third round of presentations the student-authors discuss the draft texts of their papers written to teach the students of a major seminary the meaning of the divine-human exchange by means of the three prayers of the chosen formulary. The final text of this lecture is submitted for valuation at the end of the course. Participants submit their presentations and the draft of their final paper to the instructor several days in advance and then consider suggestions given. Please do not phone the instructor. Rather email him at danielmccarthyosb AT mac DOT com. ♦ LEACHMAN, J.G., – D.P. MCCARTHY, “A Liturgical Study of the proper prayers for St Charles of St Andrew Houben, C.P., (1) The Opening Prayer,” Questions Liturgiques: Studies in Liturgy 92 (2011) 28-44 (second edition of “J.G. Leachman, “Studium liturgiczne kolekty o św. Karolu od św. Andrzeja Houbenie CP”, Słowo Krzyża Crucis Verbum 4 , 230-243). Preparation: Having agreed with the instructor upon the three prayers of a Latin formulary from the Missale Romanum, the student conducts his or her own study of the prayers and presents the findings in three brief seminar presentations. The student also participates in the seminar discussion on the research of other colleague-participants. The student uses the shared discussion and personal research to revise and further develop a final paper. Explanation: The student presents his or her findings in class three times and has the chance to revise the material based on class discussion and feedback from the instructor, before submitting a research paper of 10 pages of text but not more than 15 pages, following the norms of the PIL (without binding). The norms of the PIL may be downloaded here. When: The final paper is to be handed in to the Registrar no later than 30 April 2019. If the student would like to receive back a copy with notations and comments the submission should be accompanied by such a request. A copy will be left in the office of the registrar (segreteria). The program of studies, course descriptions and calendar for the academic year 2017-2018 is available for download here. Since this is a seminar and the students are expected to work together, we shall begin with general introductions of the students to one another. We shall go over the syllabus, bibliography and make a visit to the library. For session 2 the students are requested to choose the mass formulary they wish to examine. A formulary consists of the three short prayers assigned to one mass: the proper collect, the prayer super oblata and the prayer post communionem. In choosing a formulary, participants in the seminar may choose the formulary of a Sunday of ordinary time, a Sunday of one of the four seasons or one of the feasts of the Lord which is observed on a Sunday (but not the Easter vigil). Participants may examine another formulary after having secured the assent of the seminar moderator. Each student is encouraged to access the instructor’s English translations of numerous mass formularies of Sundays and feasts published in The Tablet of London from 28 November 2009 – 20 November 2010, available in the library. A listing of these commentaries arranged according to their liturgical day are found at this link. At that link you may find commentaries of many of the three proper prayers that may occur on a Sunday. The final entry for each day has the heading, “Study translation of the four prayers”, where you may find our translations of the three proper prayers along with a preface. During this first encounter, the seminar moderator will present his analysis of the following mass formulary, thereby offering an example of what the participants are to do in their presentations. There are four steps to this presentation numbered below, followed by a fifth step with which we begin the analysis of who does what to whom. et ( ad aeternae vitae gaudia ) pervenire concedas. and may you allow us to arrive at the joys of eternal life. we may likewise live up to it by worthy actions. fac (ad novitatem vitae ) ( de vetustate ) transire. to pass from oldness to newness of life. Collect: D.P. McCarthy, “Towards eternal joy”, Listen to the Word, The Tablet (13 May 2006) 25. Super oblata: D.P. McCarthy, “A holy transaction”, Listen to the Word, The Tablet (19 April 2008) 17. Post communionem: D.P. McCarthy, “From old to new”, Listen to the Word, The Tablet (9 May 2009) 17. Formulary and translations: D.P. McCarthy, “Mystery ever Growing”, Listen to the Word, The Tablet (1 May 2010) 20. 2. After presenting the clausal structure of these prayers, the moderator will then draw a tree showing how one clause depends on another for each of the above prayers. 3. After drawing the trees, the moderator will draw the timeline for each of the three prayers given above. sub tuae protectionis auxilio | prepositional phrase | motor 2 ? de vetustate | prepositional phrase | separation ? 5. At the end of this encounter, the seminar moderator will begin to present the semiotic analysis of the prayers by showing how to ask the question “Who does it?”. From this the moderator will examine how the divine-human exchange is presented in the general text of this prayer. both the subject of the passive form is identified and the agent of the passive action is also identified ( in rounded parentheses ). If this latter agent is not explicit, then the presenter considers the possibility of implied divine agency or another implied agent, which is also indicated ( in rounded parentheses ). In addition to the agent, some prayers include an instrument typically in the ablative. That is incorporated into the third chart, “who does what to whom”. After all of the subjects are identified along with the agents of passive forms the scholar considers how to arrange these on a series of several vertical lines. Typically I draw a vertical line on the left and place on it all the references to God, that is to tu, “you” referring to Deus or Domine, “D”. Further to the right I place a vertical line and label on it all the references to nos, “us”, given as “N”. Between these two lines, I typically draw another vertical line on which I put all the references to mediation between God and us. These forms of mediation may be Jesus Christ, fully God and fully human; the Holy Spirit; the sacraments, which mediate the divine presence; or the church. Furthest to the right I place a line for other things such as sin, vetustate, the world. The scholar will have to assess all of the subjects to be included, consider their relationships one to another and decide how to relate like subjects with like subjects and best depict the relationships among them. This may all need to be revised after completing all three charts once this analysis of the prayer is fully developed. The presenter then develops an understanding about the divine-human exchange in the subjects of the prayer by active and passive means. The previous chart is copied and the following are added to it to form the second chart. Typically the “what” is the direct object of a prayer or the object in the dative of the 65 verbs (See: Ossa, Encounter 33, item 7.2) or of the compound verbs (See: Ossa, Encounter 33, item 7.3). The objects are labelled on the same set of vertical lines in such a way that all the items on any one vertical line concern a similar field of meaning such as: God, mediation, us, other. More vertical lines can be added if wholly new topics are introduced by an object. The scholar then draws an arrow from the subject to its object indicating direct action. Intransitive verbs do not have objects, so none is given. In the case of passive forms, the scholar may wish to draw a dotted or light arrow from the agent to the subject of the passive form. Sometimes the object of a verb is an entire expression given in the accusative with an infinitive (ACI). In that case I draw a box around the ACI, and then I draw an arrow from the subject of the verb giving rise to this expression to the box as a whole. The previous chart developed from the first two questions is then copied and the following is added to it to form the third chart. Typically the “to whom” describes the indirect object of the action (in contrast to the direct object), but this is also somewhat of a grab-bag category that includes the use of the ablative and some prepositional phrases. These items are then placed on the same set of vertical lines in a way that associates similar items on one vertical line: God, mediation, us, other. The scholar draws an arrow to these final items in a way that indicates the action of the verbs passing to these indirect objects, or ablatives or prepositional phrases. From this the presenter will further develop an understanding of how the divine-human exchange is presented in the text of the prayer. This may be illustrated by a series of horizontal zig-zags indicating the alternating divine initiatives and human responses. Rarely does a prayer also present an obstacle to be overcome in the actions of the divine-human exchange. This may also be examined and presented. The presenter will seek to discern the development in the semiotics of the three prayers of the agreed upon formulary and present this. Currently ten participants are enrolled for credit in this seminar. Thus, the participants have been divided into two groups of five students for their classroom activities. During this second session, all the students will present the literary structure of their prayers to their respective groups, making sure to have time to present the answers to the question “Who does it?”. Each presenter will present the following four items for each of the three prayers of his or her formulary for no more than 24 minutes total. with brackets around each clause. Draw a tree showing how one clause depends on another and label the connecting words at the juncture of each branch, that is clause. Draw a timeline of the actions and goals. 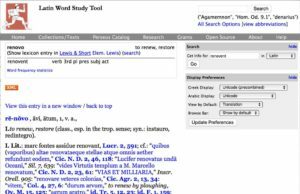 Latin text | function in Latin sentence | interpretative category. See the analysis of the literary forms in: J.L., Leachman, “The Collect for the Easter vigil”, in Appreciating the Collect, 105-140, especially pp. 117-125; and in: Leachman, J.G., – D.P. McCarthy, “A Liturgical Study of the proper prayers for St Charles of St Andrew Houben, C.P., (1) The Opening Prayer,” Questions Liturgiques: Studies in Liturgy 92 (2011) 28-44, especially pp. 31-37.
give a draft rendering of the prayer in clear English (or Italian) as well as the student’s mother language. You may use the English translations published by the moderator of the seminar. Name “Who does it?” for each action word of the prayer. The only way to achieve this is for the presenter to have prepared in advance all five items above for each of the three prayers in the formulary and to print them out for distribution to each participant. Each group will work through only as much material as is possible within the 30 minute limit for each presenter. This leaves some time for the moderator to provide further instruction during each session. In order to do this literary analysis of the prayer please consult the questions provided on the web-page for the Collects course and available by clicking here. In preparation for the first round of presentations, each student is encouraged to write out the literary analysis of his or her three prayers and present the written notes for the review of the moderator of the seminar by the Monday morning previous to the presentation. Please double-space the text so that there is room for comments. The moderator will correct the notes and leave them in the Registrar’s office (Segreteria) in the box corresponding to the first letter of the student’s surname. In this way the student will have time to revise the notes for the presentation. After reviewing the notes, the students is encouraged to make an appointment (by email) to meet briefly with the moderator of the seminar in order to clarify any outstanding questions. At the end of this encounter, the seminar moderator will begin to present the semiotic analysis of the prayers by showing how to ask the question “Who does what?”. assess the divine-human action in the prayer. and the agents of passive verbal forms. These presentations should take at most 2 hours of our session together. This leaves 30 minutes for the moderator to present one item well in advance for the second round of presentations. The seminar moderator will present the third step of semiotic analysis of a prayer by showing how to ask the question “Who does what to whom?”. From this the moderator will further develop an understanding of how the divine-human exchange is presented in the text of the chosen prayer. In addition to this, the moderator will then summarise the semiotics for all three prayers of the example formulary. Each student presents the prayers of their respective formularies during this fifth session, answering the question for each prayer, “Who does what to whom?” and developing a more fully developed image of the divine-human exchange in the prayer. synthetics = constructing the argument. We have already accomplished the first two of these. 1) Heuristics involved choosing a mass formulary and coming to understand its Latin text. We accomplished this during the first third of our course and the first round of presentations. 2) Hermeneutics involved analysing the divine-human exchange in each prayer and then discerning any development in the same over the course of the three prayers of one mass formulary. We accomplished this during the second third of our course and the second round of presentations. The third step of our method is synthetics. People sometimes mistake synthetics with simply presenting the data collected (heuristics) and interpreted (hermeneutics) in the first two steps, and then attaching a concluding summary (synthetics) to all of this data. a method of addressing this topic using the data collected in the process of heuristics and hermeneutics. Audience: The author is encouraged to imagine himself or herself as a professor in a major seminary giving a classroom presentation to the seminarians. Topic: The author is to address this one central topic: the divine-human exchange as it is presented in the selected mass formulary. This means first completing the analysis of all three prayers and then considering all the mass formulary as a whole giving particular attention to the ritual actions at the three respective moments when each of these prayers is offered: conclusion of the gathering rites; exchange of gifts; post-communion and preparation for returning home. Issues: The lecturer considers how this analysis of the prayers might address some particular struggle of the seminarians or how these prayers might suggest some considerations regarding the ministry of leading prayer or pastoring a community. For example, one basic teaching the study of these prayers has taught me is that the way in which God gives the gift is part of the gift itself. God elicits our own cooperation in giving the gift so that we become the gift we receive. Seminarians might well learn how to elicit the gifts of others and to support the ministries of others. A seminarian might teach others how to see the liturgy as the source of their ministries to others in the world and how such daily service of others finds its summit in the liturgy. Method of writing: Once the author has identified the the divine-human exchange as presented in the three prayers of the chosen formulary and how the author wishes to use this insight to speak to a specific issue the author wishes to address in the life and ministry of the seminarians, then the author prepares a written presentation for a total of 10-15 pages to use for teaching the seminarians about the meaning of the divine-human exchange in these prayers and as lived in their lives. At the end of this web-page is the first part of a sample lecture this instructor would like to give to seminarians on the mass formulary of the Fifth Sunday of Easter. This draft lecture may serve as a limited inspiration for how they might write a final paper. The author’s insights into the meaning of the divine-human exchange for the seminarians. To focus the paper, the author may wish to focus on one central element of the divine-human exchanged and trace how it develops in the three prayers of the one formulary, and from that perspective present the fuller account of the divine-human exchange in the prayers of the mass formulary. Citations: The student is to write the paper based on his or her findings, interpretation and chosen method of presenting an argument. The paper is to present the student’s own work, not the work of others. Sometimes a reference to the work of another is warranted to present an authoritative source, such as a statement on the divine-human exchange given by Irenaeus of Lyon or Athanasius. Sometimes another author has presented some ideas with such clarity that they bear repeating, as for example the translations of the prayers published by the instructor. Sometimes the student wishes to present the argument of another as a basis for developing the student’s own argument. Sometimes the student wishes to contrast the writing of another with the student’s own ideas. If I use three words or more in a row from another author, then I put them in quotation marks, either “…” or « … », and give a footnote citing the source of the text. If the citation is several lines long, then the entire text is indented, and no quotation marks are used, as for example this text is indented. A footnote citation is given at the end of the indented text. Following the quotation, the student is to state in the student’s own words the elements from the quotation that are important to the student’s own argument. In this way the student will remain in charge of the argument presented in the student’s own paper. Thus, the quotation should be only as long as is necessary for the student to make the points needed for the student’s own argument. If the student would like to take the work of another author and summarise it in the student’s own words, or to present it in the student’s own words, then, the student is to introduce the original author and source at the beginning. In this case, according to my rule, no three words in a row may be used directly from the original text. Rather, now the student is expressing the ideas in the student’s own words. The student must still give a footnote citation to the text of the original author. Not citing the work of others correctly is considered plagiarism and, according to the policy of the Registrar (Segreteria), may result in dismissal of the student or the revocation of the student’s diploma. Sometimes students have quoted long texts from other authors, without introducing the other author or the work and without giving a summary of the elements in the quotation that are important to the student’s own writing. Even if the text is properly quoted and cited in a footnote, the student is not to present the words of another author as if they were the student’s own presentation of the facts without any further critical reflection. This will not do in scientific writing. In short, the student is not to use a quotation of another person’s writing in place of the student’s own thought. Do not let the writing of others do your work for you. Rather, this is your paper and you are presenting your own argument to the reader. Take charge of your own argument. By distinguishing the writing of other authors, the student will also come to the fore as a distinct voice and contribution. In short, the student writing a paper is primarily in dialogue with the reader. Sometimes the student may wish to reflect critically on the writing of another author and to present this critical reflection to the reader. MURONI, P.A. – O.-M. SARR, Metodologia per la redazione dei elaborati, tesi di licenza e testi di dottorato, Arcane, Ariccia (RM) 2016. The paper for this seminar need not be bound: a plastic sleeve is helpful and sufficient. The student may follow the format presented in the above methodology book, or, with special permission of the Preside, students writing the paper in English may follow the following guidelines for the footnotes and bibliography which were developed by Prof. Ephrem Carr and used for many years here and for Ecclesia Orans. You may download the guidelines here. In this third round of presentations, each participant presents an initial draft of his or her final seminar paper. Each participant is invited to submit the draft to the professor before the presentation for suggestions that may then be considered for incorporation into the presentation and final paper. After presenting the paper, students may revise it and hand it in as an initial draft. The moderator will make comments that the student can use to revise the final text which is due by 30 April 2019. Again, the final research paper of 10 pages of text but not more than 15 pages, following the norms of the PIL (without binding) should be handed in to the registrar not later than 30 April 2019. When you pray to God, what do you ask for? Some of you are now in charge of writing the petitions for our daily liturgy, so I invite you to reflect on what you pray for. Do you ask God for some thing? Do you ask God to do something for yourself or for another? I would like to show you how the prayers of the church teach us how to pray. In these prayers the church does not simply ask God for some thing or simply to do something for us: “Give me a bicycle”, “Grant peace in this situation”. Rather, the church asks God to enable us do the work of God in this world. You will see that part of God’s gift is the way God gives the gift, by eliciting us and empowering us to do the work of God in this world. As God elicits our cooperation, we become part of God’s giving. We are God’s gift to the world. Our service freely given to others is the work of God in this world. I invite you to look at the three proper prayers that make up the mass formulary for the Fifth Sunday of Easter: the collect, the prayer over the gifts presented and the prayer after communion. To help facilitate our conversation I have provided the Latin text from the Missale Romanum 2008 with a study translation of the collect. Let us read it out loud together. et ad aeternae vitae gaudia pervenire concedas. What does God give? Not a thing. Rather, God brings the Easter mystery to perfection within us. This means that God is actively at work within us. I imagine that as the Easter season comes to an end, we ask God to perfect or complete this mystery within us. God gives a second gift in this prayer in that God has deemed worthy to renew people by sacred baptism. Who are these people? Surely the neophytes who were baptised five weeks ago during the Easter vigil. We too, all the baptised may also be included in this gift of God. What is the gift? The gift is that we are deemed worthy; God deems us worthy; God makes us worthy. You see, our very self is a gift from God who created us and who deems us worthy to renew in baptism. In both of these gifts, do you see that God is the one acting, but we are the ones changing. First, we are changed in baptism when we are deemed worthy to be renewed. Second, we change as the Easter mystery is brought to perfection within us. After we undergo both of these divine actions within us and we are changed in these ways, the action of the prayer shifts to us. Next we bear much fruit. There is a subtlety here I want you to notice. It does not say that we make something or we work on something or we believe something. Our response is to bear much fruit. Do you hear the generative language used in this prayer? The prayer does not explicitly say it, but perhaps it reflects the language of baptism as being born again. God does not treat us like a thing, an object. Rather, God begets us. God renews us in baptism when we are deemed worthy, and God brings this generative activity within us to greater perfection every time we celebrate the Easter mystery. Humans are begotten, not made; persons, not things. When you become pastors, be mindful that people are not objects for your benefit, things for your use, problems to be solved. Rather, the role of a pastor is to assist God who is already at work in renewing and bringing the faithful to perfection. This is the gift of God and we are all part of the giving. Perhaps you can see in this prayer that there is an exchange going on between God and us. God deems us worthy to renew in baptism and brings the Easter mystery to perfection in us, and in turn we bear much fruit. We come to share in the divine work of bearing fruit, that is by joining in this divine work of bringing other people to new life. How do we come to share in divine life? We share in divine life by doing as God does in bearing fruit. a consideration of the divine-human exchange as it changes from one prayer to the other in the overall mass formulary.